It is worth discussing here is that, ObservableArray is not responsible to determine whether state of the objects added in the array are observable or not? It only notifies when an object is added or removed from the array. Returns index of item from the array. If item is not found then -1 is retuned. As an output we will get 0. Since studentViewModelObject is first element of the KO studentArray and KO ObservableArray is zero indexed. This function will return items from the KO Observable array Slice takes two parameters. First parameter is starting index and second parameter is end index. This function will insert an item at the beginning of the array. This will add item at the 0th position of the array. This function will create notification also. Following code will insert studentViewModelObject3 at the beginning of the array. In alert you will get Ravish. This function will delete an item at the beginning of the array. This will remove item at the 0th position of the array. This function will create notification also. This function will reverse the array. This function will sort array in alphabetical order or in ascending order. 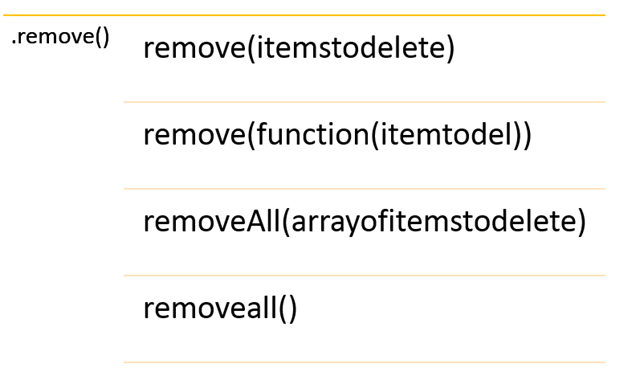 There are four ways you can remove item or items from KO Observable array. remove is specific to KO ObservableArray . KO ObservableArray is very important and useful while creating web application using KnockOut.js. I hope you find this post useful. In further posts of this series we will learn other aspects of Knockout.js. Thanks for reading.